A holiday in Port Douglas is all about relaxing and unwinding and what better way to relax and unwind than by doing private yoga classes in the comfort of your hotel accommodation? Everyone knows yoga is good for you, but it may have more benefits than you realise. For starters, how would you like a great body, calm mind and greater self esteem? Along with all that, you can expect to build strength and flexibility, lose fat and define your muscles with regular practice. 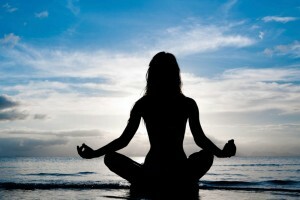 Private yoga classes can help you reduce stress, restore energy and feel radiant. Private yoga classes will leave you feeling relaxed and rejuvenated. Private yoga classes will assist you to regain your inner calm, improve your life both mentally and physically as well as tone your body. A private yoga class will make you feel alive and our experienced qualified yoga instructor will customise your session with simple and gradual exercises to suit your level of fitness. Our private yoga classes aim to help you gain a balanced and harmonious yoga experience. Your private yoga class is conducted by Lucy Chadwick. She is an I.Y.T.A registered yoga instructor with Internationally recognized credentials. Lucy has been a resident of Port Douglas for over 20 years and has been teaching yoga, relaxation and meditation for a long time. Our private yoga classes are private sessions for individuals or groups -at a time that suits you. The private yoga classes are held in the comfort of your own place of accommodation, or can even be held on the beach if you prefer. The private yoga classes can cater to any personal requests and needs you may have.